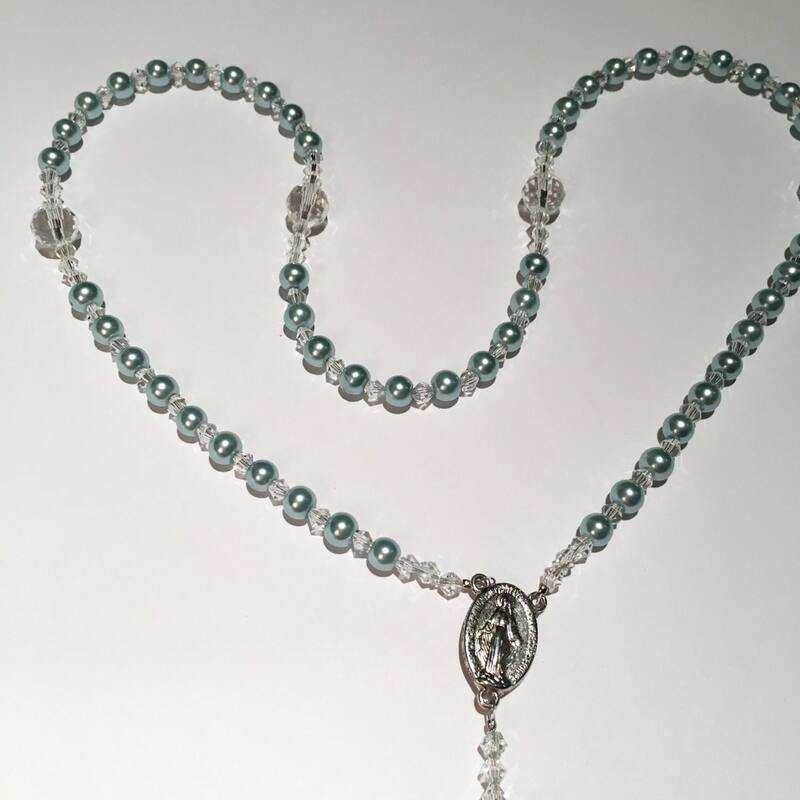 Gorgeous Handmade Rosary- Made with beautiful Pastel Blue Glass Pearls accented with clear crystals and a Silver pewter crucifix and Blessed Mother. *Can be requested in Gold. Please leave in the notes section. Due to the customization of our handmade pieces please allow 7-10 business to be shipped out. Perfect for Brides, Flower Girls, Communions, Baptisms etc. Absolutely Beautiful! I Loved it!!! STUNNING NECKLACE AND EARRINGS!!!!!!! Your work is outstanding!!! I'll post picture as soon as I can!! Definitely better in person. Very happy with the product . Payment is accepted through Paypal. You no longer need a Paypal account to pay for your purchase via Paypal - simply select the Paypal option during checkout and after you submit your order, click the pay now button and select to pay with credit or debit card or a paypal account. All orders are final sale due to customization. However, We would like to make sure you are happy with your new jewels! If you are not satisfied with your order for any reason, or if product is damaged please contact us within 5 days of receiving your product(s)and we will try our best to provide a solution. If a solution cannot be agreed upon, we will only accept exchanges and refunds under limited circumstances. All items must be returned in original packaging and undamaged. We cannot refund shipping charges on returned items and the customer is responsible for return shipping costs and insurance. Please note: We also reserve the right to refuse a return/exchange for any reason. If your product breaks at any time, you can ship it back to us and we will fix it for you. Your repair may be subject to a repair fee depending upon the nature of repair and materials needed to be replaced. Repairs needed after 30 days of purchase may be subject to a repair fee. -Protect them from exposure to water, hairspray, lotion, perfume, cosmetics and any other chemicals or product that may alter the durability of your hand crafted piece. *** If you need a different size that is not offered in the selection box, Please leave the size that you need in the notes section or message us. For stretch bracelets: We would need the EXACT measurement in inches. Please measure around your wrist with a soft measuring tape leaving no room. Feel free to contact us with any questions, concerns or any help that you may need. U.S Orders are shipped via USPS Priority Mail with delivery tracking for a flat rate of $6.10. This will add insurance up to $50. If you need to purchase insurance higher then $50, Please notify us so we can add the extra cost to your purchase order. Every order usually ships within 3-5 days of payment receipt. Any orders placed Friday - Sunday will ship the following business day. Orders placed on National Holidays will ship the first business day after the holiday. Once your item ships you will be sent A shipping notification through Etsy with a tracking number. International shipping may take up for 4 weeks to arrive if you would like to receive your package sooner please contact us to upgrade to International Priority Mail 6-10 Days for $19.95. Please note for International Orders: When package leaves the U.S we are not held responsible for any lost or damaged items. To cover your expenses, Please choose to add USPS Registered Tracking to your purchase. This cost is an additional $12.95 to the shipping rate.This will secure and track your item (s). Wholesale/Custom Orders, Please send us your details, then we will set up a price list for you. Price rate is up to amount, materials, and design per your order lot.